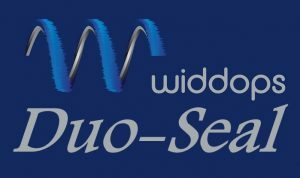 Our new Duo-Seal brush is a new custom designed seal from Widdops, incorporating the high quality brush seals we’ve been manufacturing for over 50 years with an additional secondary membrane seal. This innovative product sandwiches a solid sheet of flexible rubber membrane in-between the brush strip filaments to provide a heavy-duty solution for sealing applications where an impervious, yet flexible shield is required. The Widdops Duo-Seal can be manufactured using any of our standard filament materials used with our brush strip products and then trimmed the desired length. Typical applications are for use in cable entry seals into temperature controlled servers, wind & draught proofing seals, along with numerous other industries where a controlled seal is required with a brushes sweep effect for the containment of debris or jets of fluid.